In June of 2018, I did an interview with psychologist and ex-Mormon John Dehlin for his Mormon Stories podcast. In preparation for the show, John read Combating Cult Mind Control and told me that the book was transformative. Then he did a wonderful analysis of the BITE model of the Mormon Church which we included in a blog. Afterward, we got the idea to do a similar analysis of the BITE model and the Jehovah’s Witnesses. Now, it is Scientology’s turn. I encourage people to use the BITE model to systematically evaluate the core beliefs and behaviors to determine if it is a destructive group which uses mind control techniques. Mind control refers to a specific set of methods and techniques, such as hypnosis or thought-stopping, that influence how a person thinks, feels, and acts. I developed the BITE Model to describe the specific methods that cults use to recruit and maintain control over people. “BITE” stands for Behavior, Information, Thought, and Emotional control. It is based on research and theory by Robert Jay Lifton, Margaret Singer, Edgar Schein, Louis Jolyon West, and others who studied brainwashing in Maoist China, as well as cognitive dissonance theory by Leon Festinger. Destructive mind control can be determined when the overall effect of these four components promotes dependency and obedience to some leader or cause; it is not necessary for every single item on the list to be present. In fact, there only needs to be a few major behaviors under each of the four components. 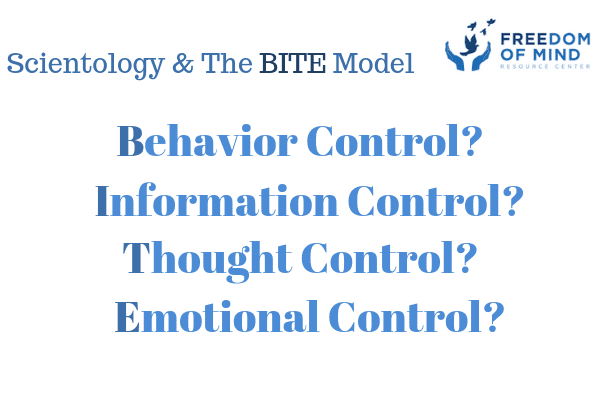 To learn more, download this detailed handout on The BITE Model or read Combating Cult Mind Control which explores cult psychology, curing the mind control virus, how to protect people you care about and strategies for recovery. (The new 30th-anniversary edition is available in print, digital format, and audiobook.) Or watch What is a Cult? Whiteboard Animation Explaining the BITE Model. Many people incorrectly think of mind control as an ambiguous, mystical process that cannot be defined in concrete terms. In reality, mind control refers to a specific set of methods and techniques. Destructive mind control can be determined when the overall effect of these four components promotes dependency and obedience to some leader or cause; it is not necessary for every single item on the list to be present. In fact, there only need to be a few major behaviors under each of the four components. However, it is obvious from the above evaluation that Scientology is a dangerous and destructive group that exercises control of the behavior, information, thoughts, and emotions of its members. All members must follow rules, some more strictly than others. They must behave according to these rules, disconnecting from SP (suppressive persons) and critics, confessing private thoughts and actions during auditing sessions, and reporting on each other. Information about Hubbard and certain teachings are kept hidden with certain beliefs being revealed only at higher levels in the group. The fear of losing friends and family from disconnection is a powerful example of control. Scientology uses internally-produced propaganda along with misquotes from non-cult sources to manipulate members. They use all of the methods above to reshape a member’s identity and reality. Yes, Scientology exercises dangerous undue influence and destructive mind control on all involved. If you have never been a Scientologist but, rather, have been involved with another controlling group or relationship, I encourage you to review the BITE model components, along with the Influence Continuum and honestly evaluate whether your organization or relationship practices some of most of these behaviors.